BLL is British Forces but counters need a BFPO number to input to the system, or else a zero label might be produced (for the forces that are in active service areas, like Iraq and Afghanistan). This month's surprise new stamps are the 1st & 2nd Machin definitives with security features from rolls or coils. But if you're a collector with a Bureau standing order for 'visible changes', you won't get these despite there being a quite obviously visible change, because this is not a philatelic product. The rolls are available only from Royal Mail Direct in Edinburgh (ie the room next to the Tallents House bureau), and exist only as rolls of 10,000. So if you have the price of a small car - £6,900 - you can buy 10,000 of each. The rolls have sequence numbers every 10th stamp, so the way to collect will probably be in strips of 3/5/10/11. EDIT: These are not on philatelic release. They were discovered on a mailshot from a financial institution, and only by the addressee spotting the new code. Therefore there are NO first day covers. We will, however, have some strips with and without serial numbers, and single stamps will also be available. We'll be writing to regular customers about these in the next couple of days, and welcome enquiries from other collectors. We now have these together with all the other security definitives in our online shop. If the combination you want isn't there, please email from the site and we will do our best to supply you. When in July 1969 did Apollo 11 land on the moon? 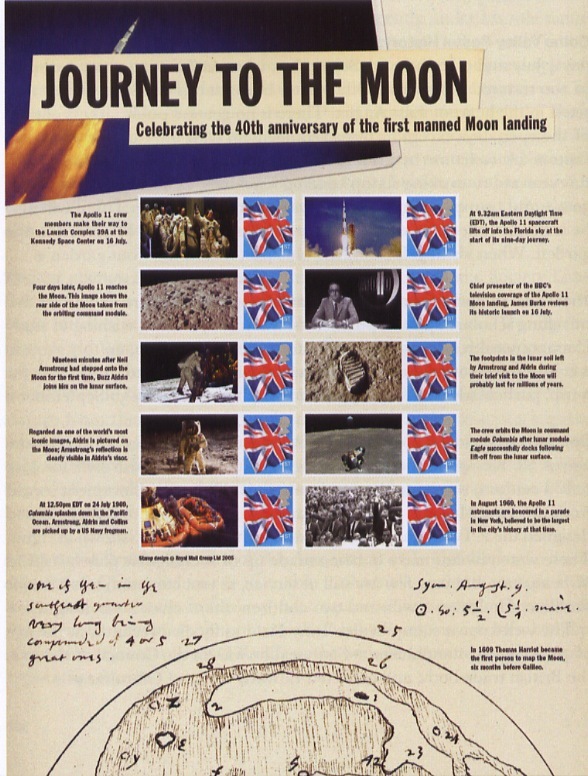 Royal Mail is issuing a 10-stamp commemorative sheet marking the 40th anniversary of the first manned moon landing. The sheet is issued on 21 July. Internetstamps are producing a similar Business Smilers Sheet and they have sponsored a pictorial postmark for the 20th July for covers that they are producing. 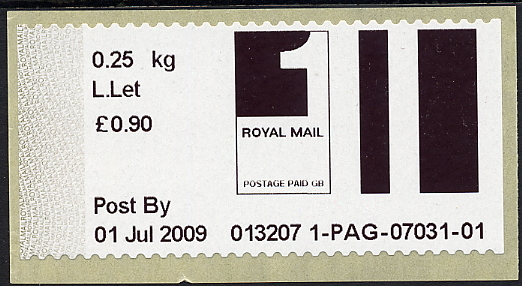 That postmark of course can't be used on the Royal Mail sheet which is issued the following day. This all comes down to the fact that the moonlanding was a night-time affair, grabbing prime television audiences. I remember watching through to the early hours of 21 July as Neil Armstrong stepped onto the moon's surface. In Houston it was still 20 July, which is why wikipedia records that "On July 20, Armstrong and Aldrin became the first humans to land on the Moon, while Collins orbited above".